I’ve been doing a number of practice-led workshops in Secondary schools lately, including Knutsford Academy in Cheshire and Cowley International College, St Helens. I thought I’d share a few pictures here. Both schools wanted me to work with KS4 & KS5, although the sessions are equally suitable for younger age groups. I started both sessions with a show and tell of my work, having brought original artworks, documentation, specialist materials and contextual reference books for them to handle and explore. Students are able to ask questions about the work – it’s production, the ideas behind it, and about the practicalities of working as an artist. My practice is responsive to what I observe around me, so with Knutsford Academy we spent a while roaming the school, making observational drawings of small patterns and details that we would use in works later. Following that, I’ve demonstrated a number of techniques, including using graphite powder, stencils, waxes, erasing, polishing and more. Students created a study sheet exploring the materials, most of which are readily available in school, with more specialist items being provided by me. 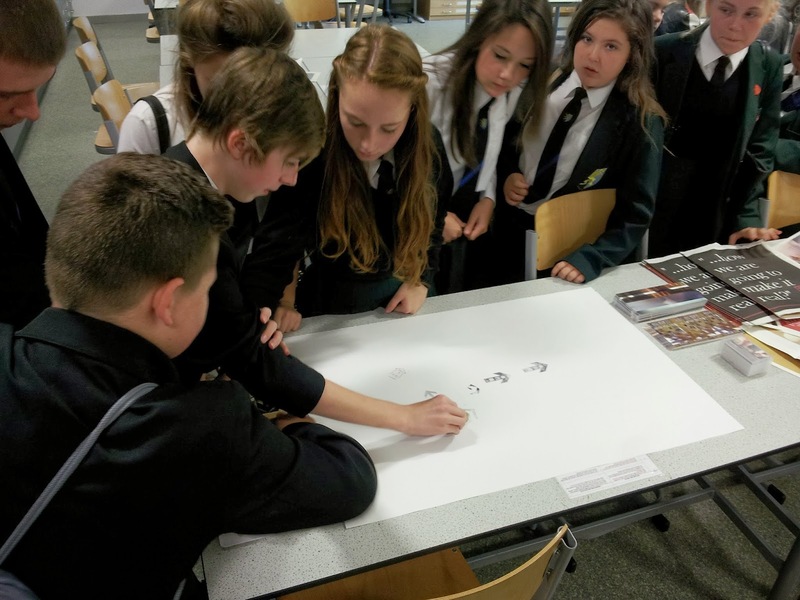 The students of Knutsford Academy spent a whole day with me, so were able to really get their teeth into their work, with the afternoon providing time for them to explore creating an animated drawing using the techniques from the morning. 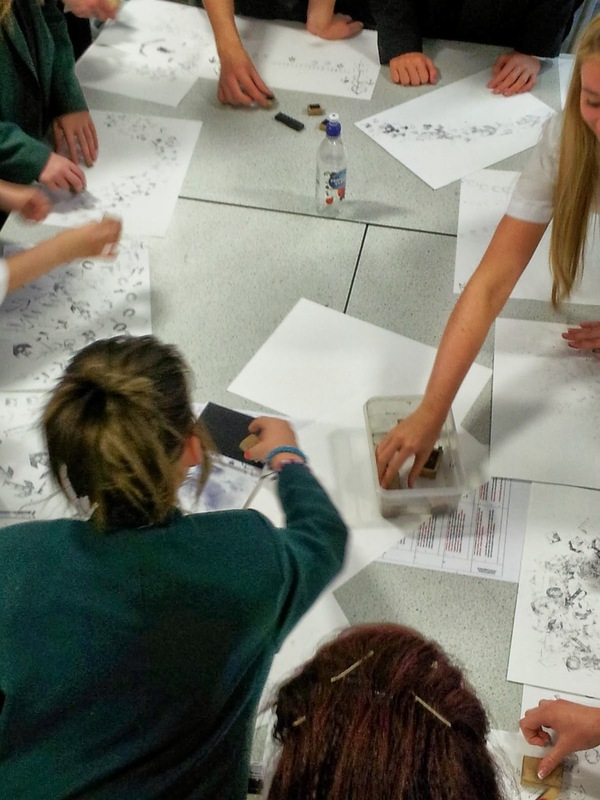 The graphite samples were mounted onto small panels and used to create an installation on the classroom wall, with other sample drawings being available to go into portfolios towards assessment. In Cowley International College we looked at both my graphite works and my recent body of work featuring arrows and signage. This day was structured differently as I met 5 different classes for 1 hour each. The students were again able to handle original artworks, and spent some time looking at the works, determining how and why the artworks had been made before sharing their findings with the rest of the class. A short practical activity rounded off the session, with students able to experiment with graphite powder and stencils or to ‘draw’ using my collection of custom made rubber stamps. The teachers will now develop work within the Art and Design curriculum including contextual references to my practice and taking forward some of the techniques demonstrated.